Interior designers are always on a quest to find the best sofa in the world. This may seem frivolous to some, however tell me just how many hours you sit on your sofa? Be honest. This is a very noble quest! A sofa is a piece of furniture that goes well beyond aesthetics alone. They need to look beautiful of course, however they also need to perform. They need to be very comfortable, the fabric needs to wear well and not show stains, and they need to last. We ask a lot from our sofa. And because it is a piece of furniture that we believe investing in, it’s important to choose the right one. I’ve specified very many sofas for clients and owned a few myself! Here are my recommendations arranged into categories of the Statement Sofa, Leather Sofa, Go-to Sofa, Modular Sofa, Cane, Small Spaces, Curves, Dream Sofas and even something for those living in share houses. And if you hate every sofa here, I even have something for you too! Do you want a sofa that has something interesting to say? A sofa is doesn’t just facilitate conversation, it IS the conversation! The statement sofa is the main event in the space. They are sculptural and different, they’re conversation starters, they’re friends with big personalities. The Bohemian range by Patricia Urquiola is a favorite of mine (let’s face it, everything by her is my favorite) because it ticks a lot of boxes. It has a traditional element, with echos of the old Chesterfield buttoning style but in a completely new way. The Bohemian is the perfect fit for a formal room in a Victorian style space, but with an edge. We have specified this in a pink and blue armchair version (it takes on a whole other personality) and we are waiting for the sofa in divine green leather to arrive for some very cool clients. Needless to say, I’m a huge fan of the Bohemian. Yes, it’s slightly crazy but also incredibly clever and totally original. Known as the never-ending-sofa, there is nothing else that even comes close. Each module locks then zips together forming a sofa that can gently bend and curve it’s way though the space. It’s made a few cameo appearances in films such as The Hunger Games. More recently it made an appearance at Club Unseen by Studio Pepe in Milan. Although it was designed in 1972, I feel it’s making resurgence right now. If you were thinking that a leather sofa made in Switzerland sounds expensive, then you’d be right! Tactile Sofa by Baxter from Criteria & Co. This leather sofa is designed by Vincenzo de Cotiis, a Milanese architect and designer. It’s low, streamlined shape is definitely different and somehow reminds me of vintage car upholstery. 1. Never have two leather sofas in the room. It will be too much leather and feel heavy and overwhelming. 2. Instead, one leather sofa and one fabric sofa, to soften the look and allow the leather to be the focal point. 3. Never, EVER use shiny leather. It needs to look natural with a matte subtle feel, not stretched tight and slick. 4. Leather looks gorgeous in an array of natural colours from cream, beige, tan, cognac, greige, light brown through to dark brown, even forest green. 5. I am not convinced that a bright white leather sofa is ever a good idea, and I’m yet to meet a black leather sofa that doesn’t look sleezy. If you know one, please introduce me. 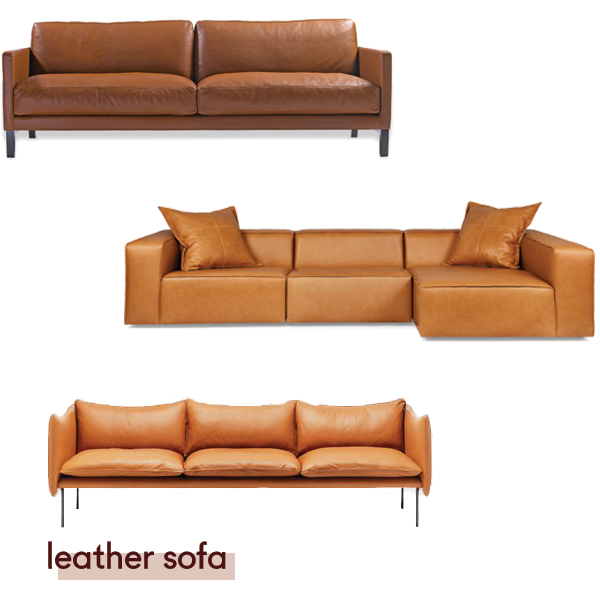 There are so many gorgeous leather sofas out there, however I have narrowed this down to three. The thing that made me fall in love with this sofa is the soft, squishy leather. The seat cushions are filled with a blend of duck down feathers for softness and synthetic fibres for resilience. You just sink right in. It still keeps a minimalist shape with slim armrests, which make it perfect for small spaces too. It’s a timeless classic. Made in France using the most gorgeous quality leather that only improves over time. This sofa is absolutely stunning in person. What isn’t conveyed in the image, is the open seam at the corners of the buttery soft leather. So you see the lovely raw edge of the leather and it just feels incredible and natural. And because these sofas are made entirely in Melbourne, they offer the luxury of customization. It’s always worth asking the lovely team at Arthur G if there are images of their sofas in other fabrics as it really helps get the ideas going. So light and elegant with a slightly curved profile to the back and arms makes the Tiki stand out from the crowd. Designed my Norwegian designer Andreas Engesvik it’s a modern classic in my book and a sofa I regularly covet. These sofas work well in almost any space. They are great for family life as the sofa that everyone including the cat wants to sit on them. The go-to sofa has to work hard as well as look gorgeous. We watch tv, entertain, relax, sleep, and sometimes eat dinner on them. Fabric choice plays a big part choosing a sofa that is the right fit for you. They tick all of the boxes of comfort, durability and quality. I first tried this sofa at Denfair last year and it was just divine! Those armrests are like soft squishy pillows and provide the comfort, without the loose cushions that needs fluffing up. It’s so comfortable and always looks neat and tidy. The Wilfred looks so gorgeous and plush, but still has a light appearance. The floppy arm-rest over the solid oak frame gives it a lot of personality and a casual vibe. When it was released a few years ago, designers kind of lost their minds and we are still in love with this guy. I’ve seen it ‘dressed up’ with a leather side and back detail by a very clever designer (Hi Gillian). It’s incredible how upholstery selection can totally change the look. With a slightly mid-century Scandinavian vibe, this is a true classic. The high back makes this an extremely comfortable sofa, without being bulky. It looks beautiful in leather however there are some lovely fabric options available and since its made in Melbourne, there are plenty of options! I am a bit conflicted about modular sofas. I get it, they are great because you can lie on one end and sit on another and some spaces just suit modular sofas perfectly. However they are just SO BIG! I prefer two sofas and some armchairs for variety and interest. I prefer modular sofas to have a light appearance to that they don’t completely overwhelm the space. However these modular sofas are absolutely gorgeous and want nothing more than for you to just lounge on. They are perfect for Netflix binges, rainy Sundays and theatre rooms. The Arkley Modular sofa from Jardan‘s brand new ‘Art Series’ range is brand spanking NEW! An uncharacteristically curvy, Seventies inspired shape ensures this eye-catching piece is destined to be a future classic. We love it in the smaller 3-seater shape, too! All Jardan’s pieces are made in Melbourne, which is always a plus. The Tufty Time is one of those sofas known by name. It’s kind of famous amongst designers. I would go so far as to say that it is a design classic of our time. It was designed in 2005 by visionary designer Patricia Urquiola. It’s a modular sofa with the ottoman at the core, allowing for multiple configurations such as for the seat to be very deep, or the armrests high or low. You can design some creative configurations perfectly tailored to needs of the space. It invites lounging however it always looks smart and the upholstered form doesn’t need plumping up. One to save up for! This is the really the ultimate sofa that designers love to use. Its refined shape, soft seat cushion and elegant legs make it a modern classic. It looks gorgeous in fabric and leather, even in quilted fabrics because the shape is simple. You know what I mean; it’s that sofa in the entry that you use to put your shoes on. Or the sofa in the bedroom that you bought with ideas to sit and read on, but you’ve NEVER sat on it, it just gets piled with clothes. This kind of sofa looks gorgeous but comfort is not their most important function. I hope that I don’t get slammed here for advocating somewhat of a replica piece, however as far as I could see the original Jan Bocan armchair in this style is no longer available by Thonet. This version is cane rather than the original bentwood and is pretty darn cool. If you have been living under a rock these past few years, you may not have noticed that cane webbing is having a serious moment. This Cane Sofa is refined and elegant and it would look perfect in a sunroom. Curves are back baby! There are a few sculptural sofas that have been released recently and they make quite a refreshing change from the square bulky shapes we’ve know and love. This generously proportioned sofa is almost more like a sculpture than a sofa. The Julep sofa is inspired by the Avant-garde furniture of the Fifties, I think its beautifully feminine and just gorgeous. The swooping curves of the arm invite you to come in for a hug. The delicate sculptural leg give the sofa a floating appearance. It’s an extremely elegant and tailored sofa, one for the ‘good room’ for sure. What you see is what you get with a sofa like this. This neat shape is always going to stay the same, no plumping, fluffing or faffing required. 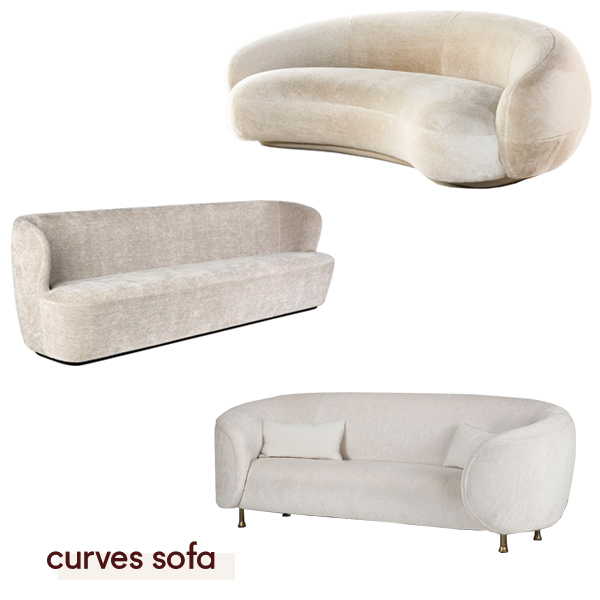 This is a great option if you have a sofa in the centre of the room, as it’s curves look beautiful from every angle. A lot of sofas are just ENOURMOUS and they won’t fit in the living room of an apartment, that’s if you can even get them up the lift in the first place! And lets face it, apartment living is on the rise and just because it may be small in size, it doesn’t mean that your sofa can’t be extremely comfortable and gorgeous! In fact, I would argue that because it’s smaller, more of the budget could be invested in a quality sofa and fabric, rather than something huge, just to fill a big space. The Camille is most perfectly proportioned sofa with a slightly playful vibe. Designed by French/Australian furniture designer Anne-Claire, there is something very cute and sophisticated about the Camille, maybe that’s a French thing? Anyway, it looks gorgeous in upholstered in a plush velvet and it’s extremely comfortable! What I love about this sofa, is that it’s both delicate and boxy at the same time. The fine arm profile is maximizing the seat space, which is perfect in a small space. Designed by Norm Architects, its both homey and architectural at the same time. The Togo is having a bit of a renaissance at the moment, as many designs from the 70s emerge. The sofas are low, plush and extremely comfortable, they seemed to know how to relax back in the 70s! The Togo is made in France by Ligne Roset and has a youthful vibe. Ok, so you live in a share house. This doesn’t mean that you have to sit on that skanky sofa that’s just always been there, but no one knows where it came from. Get your housemates to pitch in to buy an affordable sofa. Failing that, make them pay a price-per-sit fee. This sofa definitely gives a good bang for your buck! It’s really well priced so if you’re just moving out of home for the first time this is a great option. Sure it may not last you a lifetime but it looks cool for now. The fine arm profile of the Como sofa allows for more seat space, with those two little cushions included to soften the look. A nice classic design and neutral colour options makes this such a neat, versatile little sofa with a neat little price to match! The great thing about this, apart for its affordability is that is going to work well for those living at your house that aren’t so careful, if you know what I mean. The dark colour will hide all manner of stains (!) and the smooth upholstery always looks neat. These are the sofas that designers lose their minds for. When we specify them for our clients, we get insanely jealous and possessive, we just want them for ourselves. This sofa gives me that feeling of walking out of Baby Pizza wishing that I wasn’t wearing jeans, apart from that, I am in love with this sofa. Bulky and soft at the same time the Sesann Lounge was designed in 1969 and later went into production. When I asked my designer friends what their favorite sofa is, the Maralunga came up more than a few times! Another design from the 70s that is relaxed and instantly recognizable with its folding backrest. If you can find an original in good condition, its better than winning the lotto! If you ask me what my favorite sofa is, well it changes…. At home we have the Togo and it’s a great sofa for a young family. It doesn’t need any plumping up and the kids can jump all over it, and it doesn’t matter. It always looks good. However if I had to choose another, the Cloud by & Tradition is a firm favorite. It has the right amount of structure and softness, it looks good from all angles, and it’s comfortable and elegant. If all of the options above left you feeling a bit, meh….? There is a secret weapon out there that allows you to have the extra deep seat if you’re tall, or the wider arm at the perfect height so that you can rest your head on and fall asleep within three minutes. Or the perfect fiber fill that you don’t need to fluff up all the time. Maybe it’s the things you don’t even see like an all-natural fibre filling, free of formaldehyde that you don’t want to inhale. You may need an extra hard-wearing sofa which uses a luxury performance fabric such as the Perennials 100% solution dyed acrylic. These outdoor fabrics might sound nasty but believe me they are GORGEOUS! There is another world of sofas that are custom made to your specific requirements. Beyond choosing a different leg or fabric, there are so many options out there that an interior designer can bring. Interior designers have a wealth of resources when it comes to sourcing the perfect fabric as well as the furniture fabricator that are trade-only and also supplies sofas to your favorite stores. It means that you will own a sofa that your neighbours won’t have, but who really cares because your sofa is about what fits perfectly for you YOU!